Brazil’s efforts as defender of internet privacy and rights may be effective even if it sparks criticism from all sides of the issue. Along with German Chancellor Angela Merkel, President Dilma Rousseff has been among the most vocal protestors against spying by the U.S. National Security Agency (NSA). She used her opening remarks at the United Nations General Assembly (UNGA) in September to criticize the spying. Three months later, the UNGA passed a resolution initiated by Brazil and Germany in favor of the right to privacy in the digital age. The Brazilian Chamber of Deputies and Senate have passed legislation, known as the Marco Civil da Internet, which web leaders and scholars consider a pioneering framework for internet governance. Last week, Brazil hosted the international meeting NETMundial, focused on standards for name registration, domains, and IP addresses. Rousseff and her Science, Technology, and Innovation minister, Cleio Campolina, emphasized that, as the first such event since U.S. intelligence contractor Edward Snowden leaked information about abuses, privacy concerns should be paramount at the meeting. 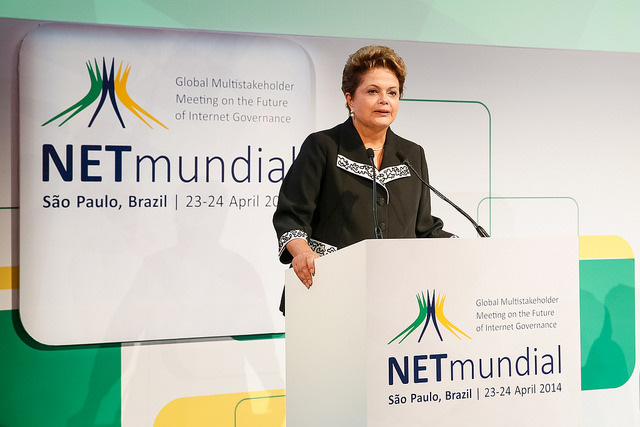 Brazil has considered itself an emerging leader in internet governance for at least the last fifteen years, although until 2013 “digital sovereignty” and the allocation of commercial benefits appeared to be more important goals than protecting civil liberties. Brazil also has counted itself as an important member of a coalition — including India, China, Russia, Arab countries, and the United Nations Working Group on Internet Governance – that has called for less U.S. dominance of internet governance. The group has proposed that the UN’s International Telecommunications Union (ITU) assume responsibility for the Internet Cooperation for Assigned Names and Numbers (ICANN), the non-profit organization in charge of distributing domain names since 1998. An American creation, with headquarters in Los Angeles and a Board of Directors supervised by the US Department of Commerce, ICANN is seen by many as embodying U.S.-centric internet regulation. Critics in Brazil and elsewhere claim that the private-sector and civil-society input into ICANN decisions is disproportionately pro-American. The U.S. and its supporters, including Google, Microsoft, and civil associations like the Mozilla Foundation and the Electronic Frontier Foundation, argue that the existing regime promotes a “free and decentralized internet” – and that any changes must preserve these principles. Since Snowden, President Dilma has also renewed emphasis on “digital sovereignty” measures. For example, provisions in legislation passed in the lower house (but removed from the Senate version) required that Google, Facebook and other companies doing business with Brazilians store their data about Brazilians on local servers. The government has also promoted building fiber optic cables connections that do not go directly through the United States as a way of preventing NSA espionage. The economic and technical feasibility of some of these projects is not clear, and some of them have encountered important political opposition within Brazil – because, according to an informal survey of experts, many Brazilians are suspicious of their own government’s regulation of the internet as well. Language in the new bill simply obligates business to obey national legislation regarding privacy. Snowden’s revelations have given a boost to efforts to reduce U.S. dominance of internet governance, which previously was viewed as a technical issue for which the existing regulatory regime worked well. Announcing that the U.S. Department of Commerce will not renew its contract with ICANN when it expires in September 2014, the Obama administration appears to recognize that U.S. credibility as the guarantor of a free and open internet has been undermined. The exact technical and legal procedures through which privacy and national sovereignty might be better protected on the internet remain open questions in national and global debates. But Brazil appears poised to play a leading role in setting a moderate middle-range course, one that allows for multipolar or global governance of the internet while protecting the liberal principles the U.S. has long claimed are core values. Dilma could come in for criticism from both sides – U.S. conservatives who believe that only the United States can guarantee a free internet as well as “anti-imperialist” advocates who will accuse her of selling out to corporate interests. Moderate heroes are sometimes the most unsung but also the most necessary. *Sybil D. Rhodes is Director of the MA in International Studies at the Universidad del Cema in Buenos Aires. Leslie Elliott Armijo is a Visiting Scholar at Portland State University and a Research Fellow at CLALS. They are currently writing a book about international cooperation in the Western Hemisphere.